Motor starters limit the inrush current and provide a managed start of the motor. Modern starters provide much more than just current limitation. The inrush current in 3-phase induction motors varies from five to seven times the rated current. In some applications, this level of inrush current may cause a significant voltage drop in the power supply network, affecting the operation of other equipment and the motor start itself. The power supply system may even shut down in extreme cases. The high starting current of induction motors results in a high starting torque. Unnecessary high starting torque, even when not required by the load, increases mechanical stress on systems such as the rotor shaft, bearings, gearbox, coupling, chain drive, connected equipment and others, leading to premature failure and plant downtime. Table 1: Comparison of different starting strategies . This problem can be reduced to some extent by using electromechanical starters and variable frequency drives. Soft starters have been helpful in solving these problems, and they save electrical energy. 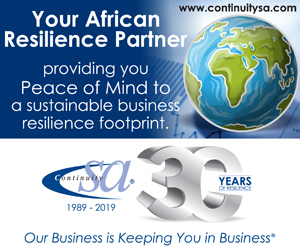 Controlled starting is essential when connected to loads which are time-variant, and where torque depends on load speed. Table 1 shows a comparison of different starting strategies. These technologies were used extensively prior to the availability of power electronics, and are still used today in applications which require a fixed starting method. With the exception of the direct online starter, all methods use some form of reducing the current or voltage during the start-up phase, and switch over to the normal voltage or current once the required speed has been reached. The start process is essentially a two-step process, the first being run-up to speed at reduced current, and the second changeover to normal operation. Fig. 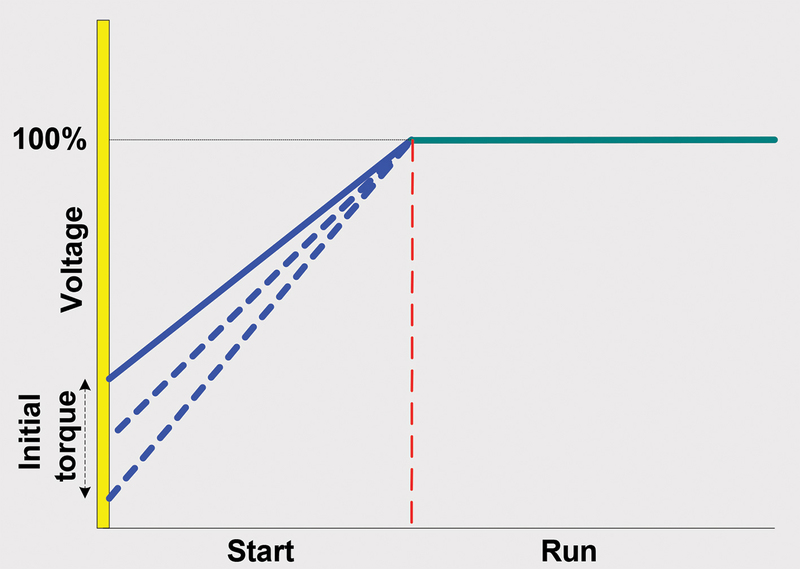 1: Current-torque/speed curves for a direct online start . In this method, the motor is connected directly on line and the only controls are an over-current relay. The current-torque/speed curves for an induction motor are shown in Fig. 1. At the start, the autotransformer is star-connected, and the motor is connected to the supply via part of the autotransformer windings. The process is run at reduced voltage, which depends on the transformation ratio. The autotransformer is usually tapped to select this ratio to find the most suitable voltage reduction value. The star connection is opened before going onto full voltage. The portion of the coil which is connected to the mains acts as an inductance in series with the motor. This operation takes place when the speed balances out at the end of the first step. Full voltage connection is made after the second step, which usually only lasts a fraction of a second. 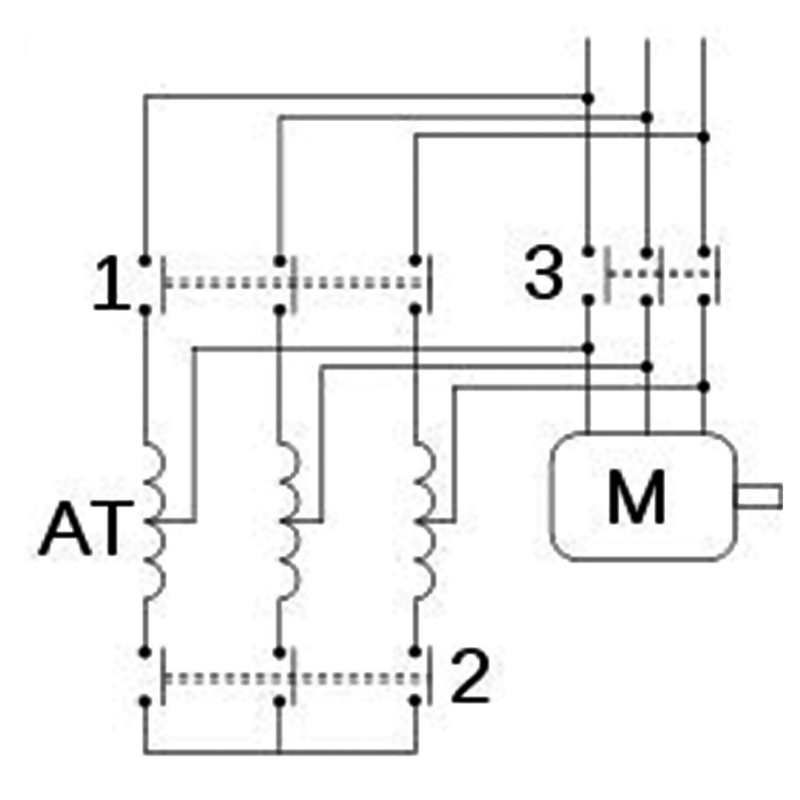 The section of the autotransformer winding in series with the motor is short-circuited and the autotransformer is switched out of circuit. Star/delta starters are probably the most common reduced voltage starters. They are used in an attempt to reduce the start current applied to the motor during start as a means to reduce the effect on the electrical supply (see Fig. 3). The star/delta (or wye/delta) starter is one of the lowest cost electromechanical reduced voltage starters that can be applied. Fig. 2: Autotransformer starter . 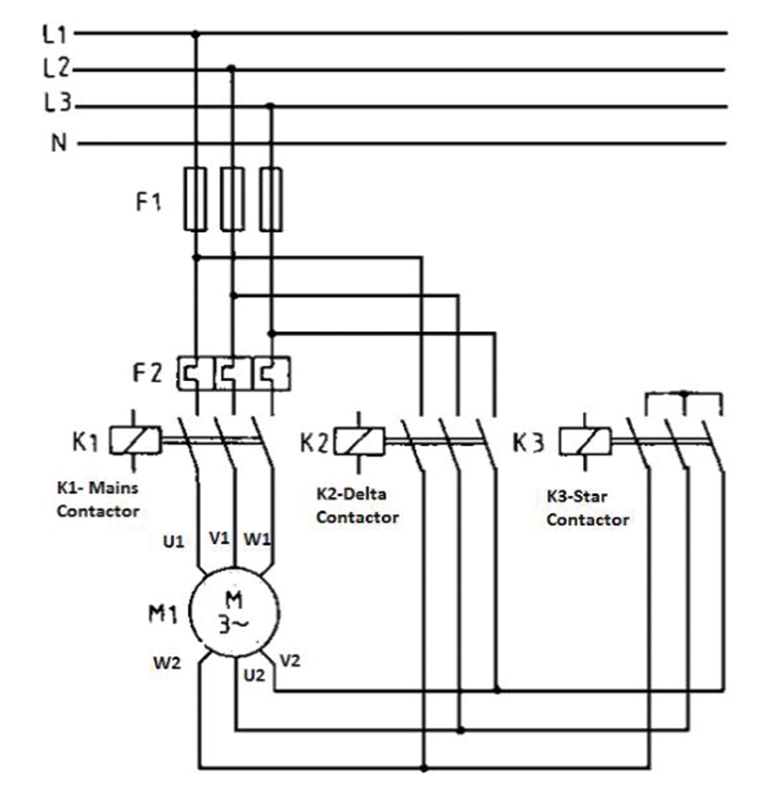 The method involves starting the motor by connecting the start windings at mains voltage, which divides the motor’s rated start voltage by the square root of three: a motor star-connected at its rated voltage absorbs a current three times less than a delta connection would. With the star connection, the current is also reduced by three times. As the starting torque (ST) is proportional to the square of the supply voltage, it is also divided by three, giving ST = 0,2 to 0,5 rated torque. The motor speed stabilises when the motor and load torques balance out, usually at 75 to 85% of rated speed. The windings are then delta connected and the motor operates as normal. Fig. 3: Star/delta starter . A slip ring motor cannot be started direct online with its rotor windings short-circuited, as it would cause unacceptably high current peaks (see Fig. 4). To combat this, resistors are inserted in the rotor circuit and then reduced in value until a full short circuit is reached, while the stator is powered at full mains voltage. The resistance inserted in each phase is calculated to ascertain the torque-speed curve accurately. The result is that resistors must be inserted fully on starting, and that full speed is reached when it is completely short-circuited. The current absorbed is more or less proportional to the torque supplied, at the most only a little greater than the theoretical value. Soft start or solid state reduced voltage (SSRV) starters use power electronics, usually thyristors or triacs, to control the current flowing into the motor both during the start up phase and during normal operation. An illustrative circuit is given in Fig. 5, with the corresponding waveforms shown in Fig. 6. Solid state soft starters use semiconductor devices to reduce the motor terminal voltage temporarily. This provides control of the motor current to reduce inrush and to limit shaft torque. Fig. 4: Slip ring resistive starter . The control is based on controlling the motor terminal voltage on two or three phases. 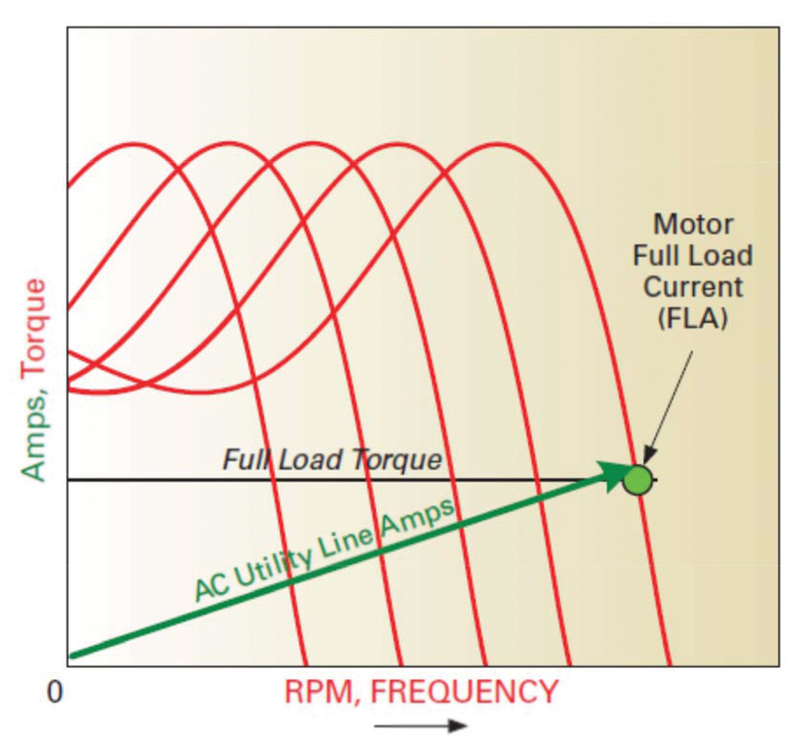 By limiting the voltage to the motor, a reduced torque is provided to start the load more gradually. A soft starter is a type of reduced voltage starter for AC induction motors. The soft starter is similar to a primary resistance or primary reactant starter in that it is in series with the supply to the motor. The input current to the starter equals its output current. It consists of solid state devices to control the current flow and the voltage applied to the motors. The soft starters can be connected in series with the line voltage or connected inside the delta loop. Fig. 5: Typical thyristor-controlled soft start circuit . Varying the conduction angle of the switches controls the average voltage, and increasing conduction angle increases the average output voltage. This process proves advantageous, with improved efficiency and lesser power dissipation. The average voltage can be altered easily using control electronics. The system may use feedback information on motor speed and other parameters to provide intelligent control. It is possible to provide a wide range of start and running control options by varying the sequence and width of control pulses. Fig. 7 shows the current-torque speed characteristics of a motor with soft start. Fig. 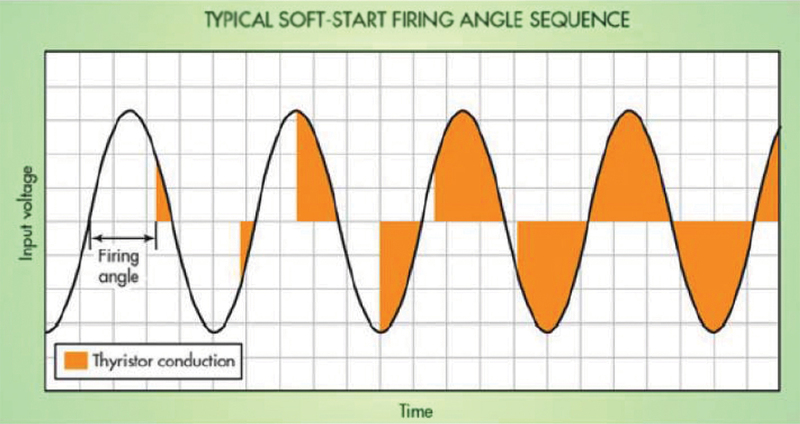 6: Typical soft start firing angle sequence . The ability to control the voltage and current in SSVD devices continuously makes possible a wide range of motor control functions which extend beyond starting the motor. 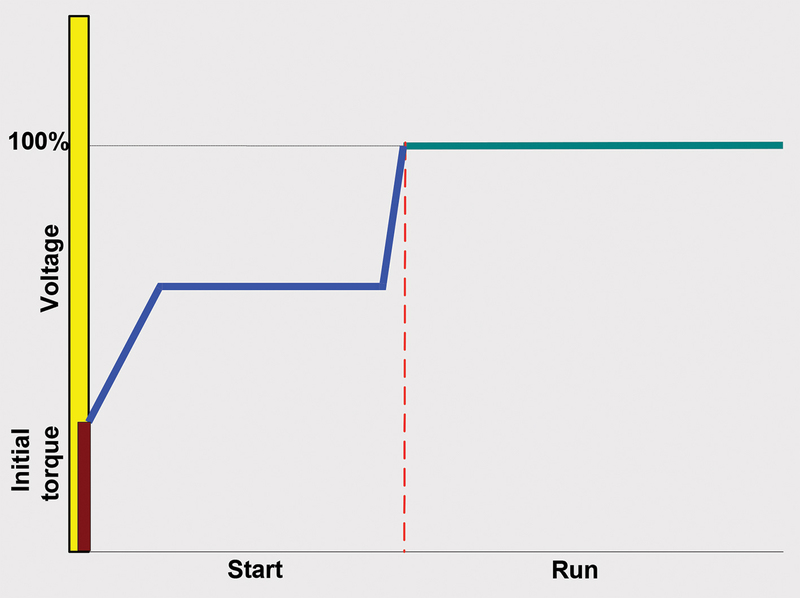 Soft start (SS) reduces the amount of current flowing during start up and can also control how long it takes for the motor to get up to a particular voltage. Start ramp is the time from when the soft starter begins to ramp up the voltage until full voltage is finally reached. The time it takes to ramp up the motor should not be very long, as a prolonged start may result in unnecessary heating of the motor and a risk of the overload relay tripping. Fig. 7: Soft start current-torque/speed curves . The simple soft start increases the voltage in a linear manner during the acceleration period, as shown in Fig. 8. The ramp may be adjustable or fixed. SS provides smooth, stepless motor acceleration while minimising damage to gears, couplings and belts by reducing starting torque surges. The ramp start voltage-torque/time curve is shown in Fig. 8. The initial torque can be varied to suit the application. Fig. 8: Ramp start soft start. To start the motor properly and to minimise time at zero speed when first starting, an initial current or torque level is set for the soft start to apply at startup. For most applications, this initial value is set to just break away the motor and its load. After the initial step torque is applied, the motor torque is increased linearly by increasing the soft start output voltage over a user selected ramp time. At the completion of the ramp time, the motor and load should be at full speed and the motor current at its normal level. Soft starts with a kickstarter function can provide an extra pulse of torque, which is sometimes required to overcome the initial friction of jammed conveyor belts or pumps, for example (see Fig.9). An activated kick start gives the necessary torque that will allow the application to break loose and the start ramp will then still provide a soft start. This feature is good for overcoming stiction of high-friction loads. Fig. 10: Current limit start. Dual ramp start provides two separate soft start profiles with independently adjustable ramp times and torque settings. It is designed for applications with varying loads, two-speed requirements and reversing. Some load applications, such as water pumping, may require that the motor does not stop suddenly. 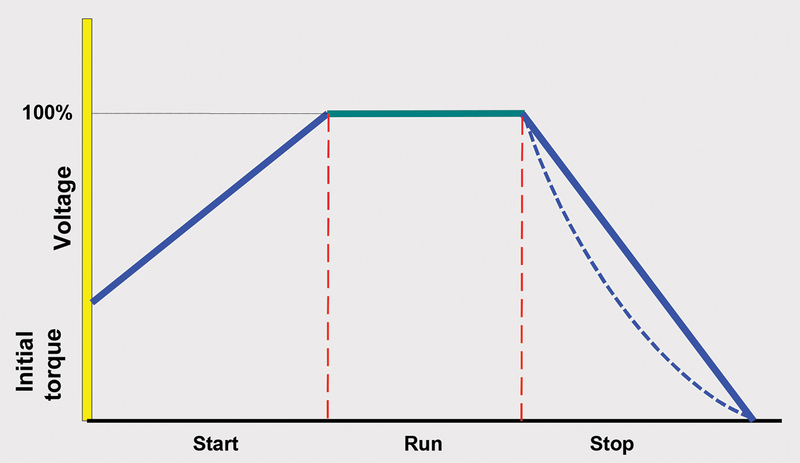 A ramp stop can be applied to lengthen the stopping period beyond the normal coast-down value. This stop works by decreasing the motor voltage gradually thus extending the stop time. 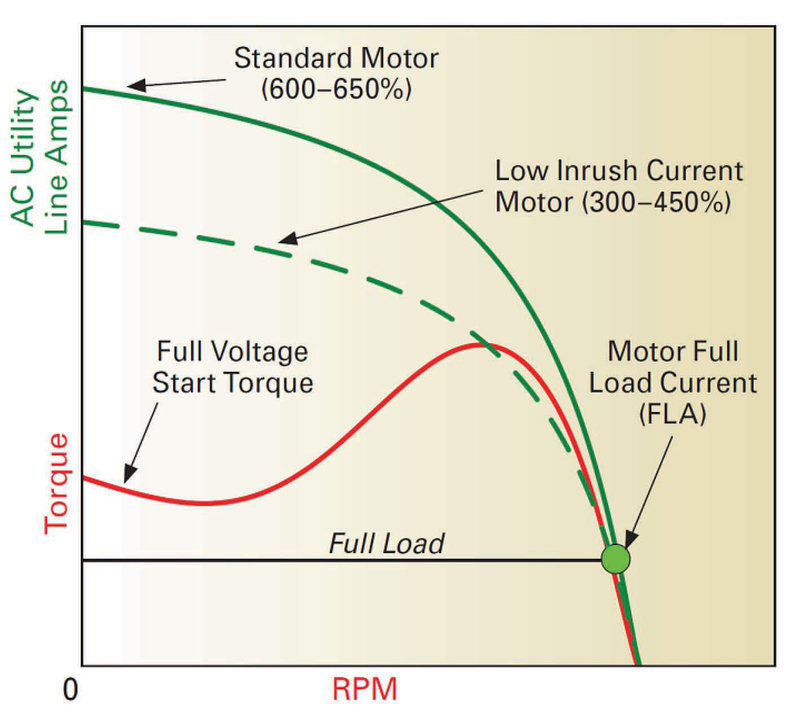 During ramp-down the controller will gradually reduce the voltage to the motor thus reducing the torque and current. As a consequence the motor speed will slowly decease (see Fig. 11). These are advanced options more related to process control than motor starting, but are available in some advanced motor control units. The preset slow speed option furnishes two jog speeds to facilitate process set-up and alignment. These speeds are available in both the forward and reverse direction without a reversing contactor. Smart motor braking stops a motor quickly for improved operation cycle times and increased productivity. Fig. 12: VFD motor start control . These units form part of variable frequency drives or variable speed drives and are used effectively to limit inrush current and control the run up to speed of the motor in a controlled manner. The choice between SSVD and VFD will depend on the application. VFD will only be used if variable speed control is required in addition to controlled start. 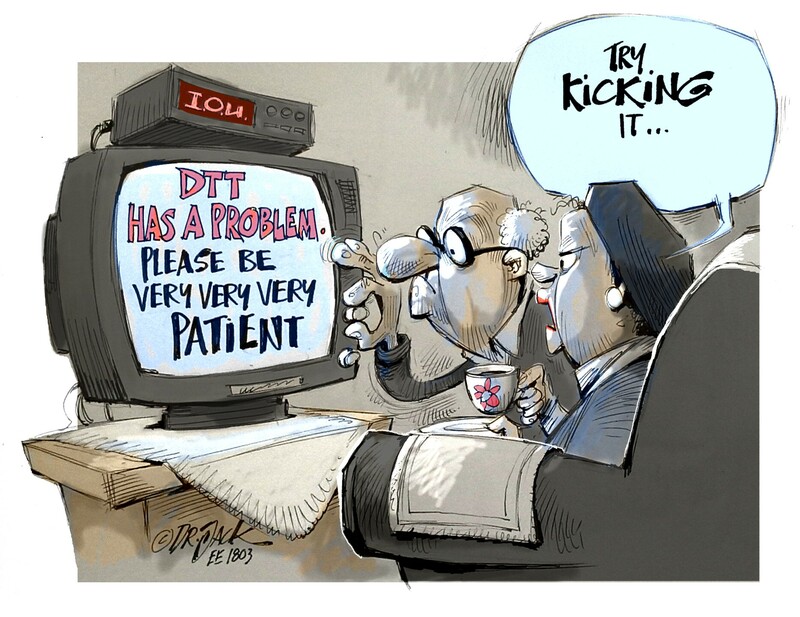 SSVD will be used if there is no continuous speed control requirement (see Fig. 12). 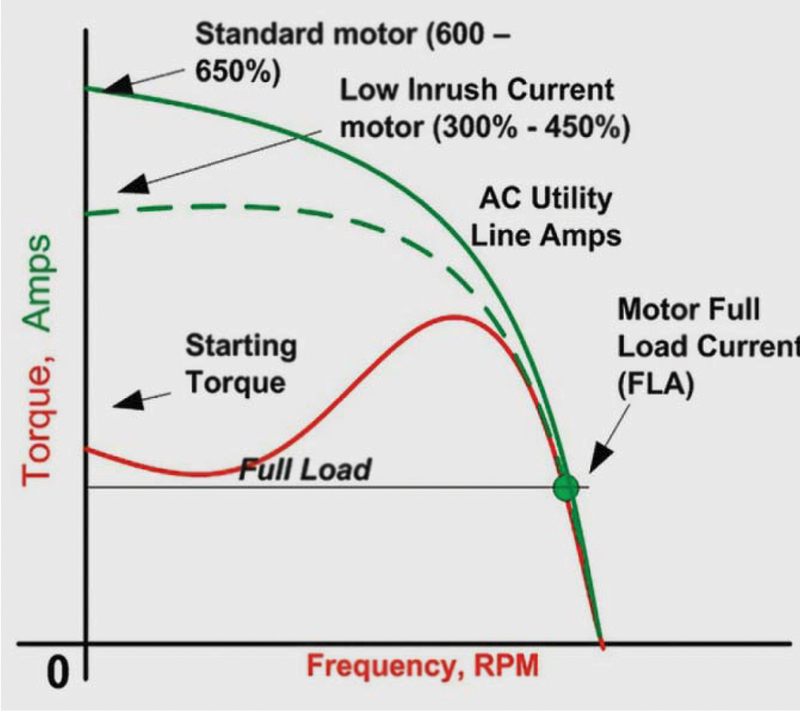 Low inrush current induction motors are specifically designed for applications in a weak supply network in order to provide a lower voltage drop without requiring auxiliary starting devices (see Fig. 13). Low inrush induction motors have an inrush current from three to four times the rated current, significantly reducing the possible impacts on the power supply network. Direct start without requiring auxiliary devices reducing costs and installation space. 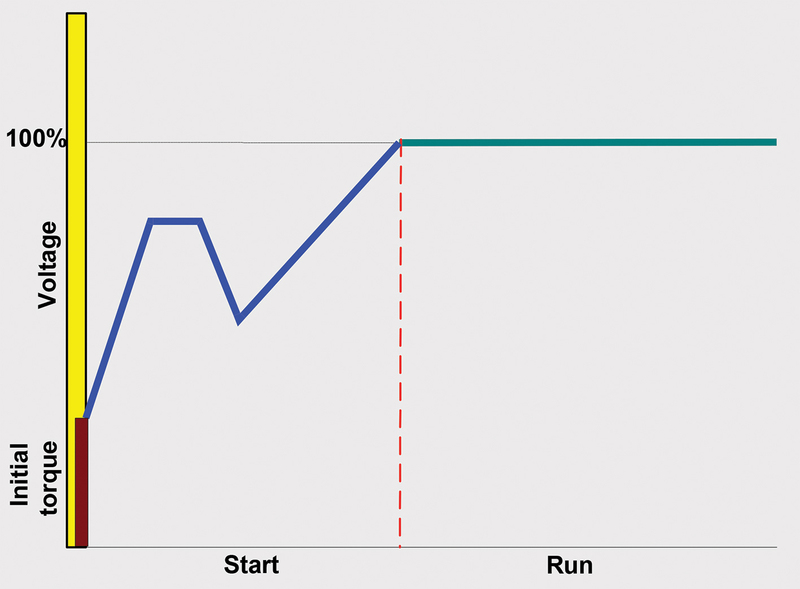 Lower voltage drop in the power supply network during start. Greater reliability without requiring auxiliary starting systems. 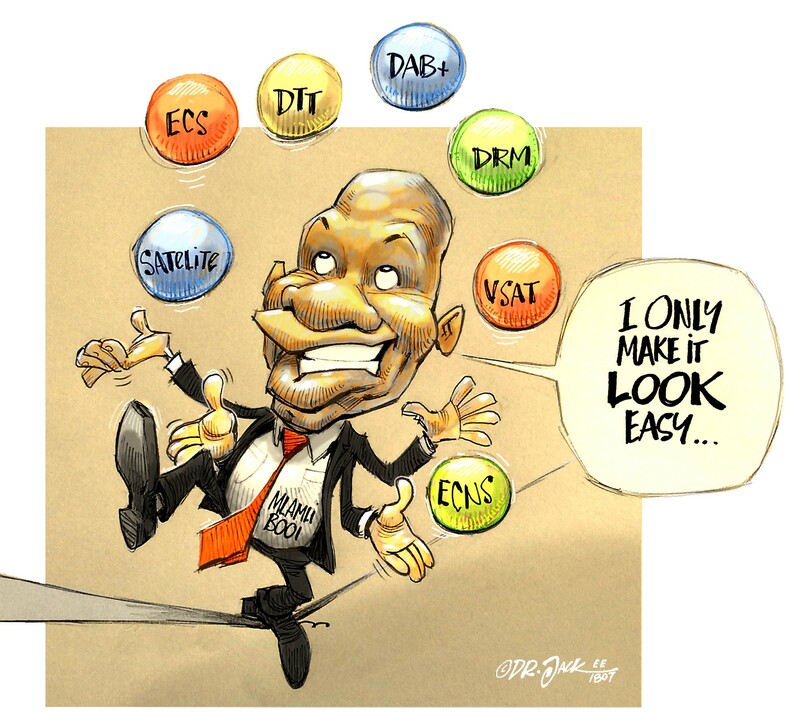 Simple drive and control systems. Low inrush current design is achieved by altering the stator core windings. Low inrush current (LIC) motors are based on the “skin effect”. When a motor is started, the magnetic field only penetrates the surface or skin of the rotor and current only flows through the top part of the rotor bars. In LIC motors this phenomenon is exploited by means of special rotor designs to reduce the inrush current. LIC motors often have lower power factor and efficiency than the equivalent regular motors; they also tend to be larger, but effective LIC design reduces the need for oversizing. Fig. 14: Double cage rotor for low inrush current motor .speed curves (TMEIC). Deep, narrow rotor bars represent a straightforward solution that can be used in most applications with moderate current and torque requirements. Narrow bars present higher resistance to current and produce higher torque, but also give rise to increased losses through heating. Shaped rotor bars – where the bar width is varied at the top and bottom – make effective use of the skin effect to separate the motor’s starting behavior from its rated operation. 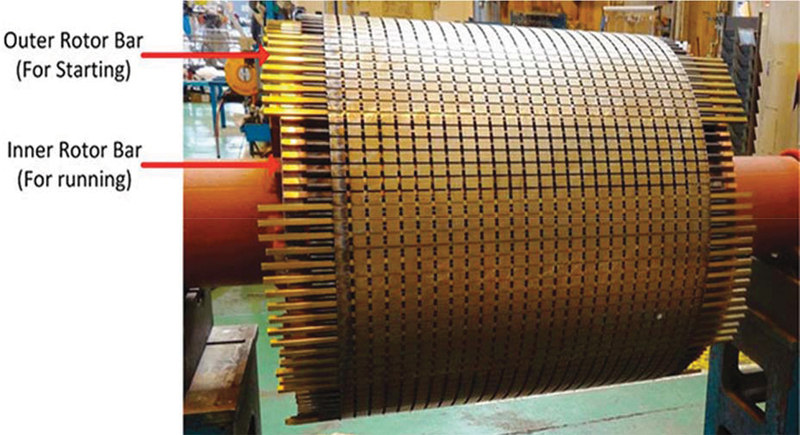 Higher resistivity copper alloys can be used for the rotor bar material. These designs provide higher torque but also suffer from increased losses when starting and in normal operation. 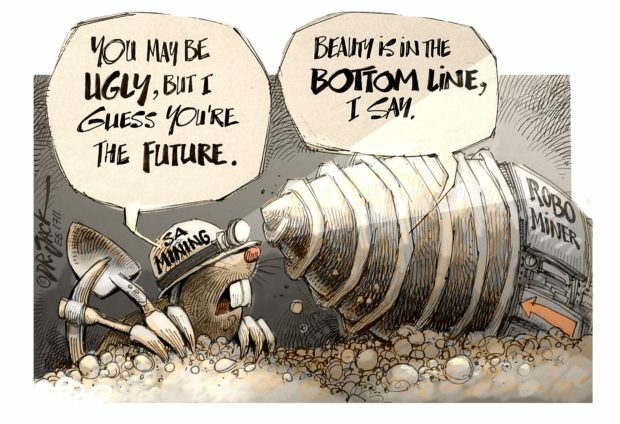 These materials are also more expensive and more difficult to source. Double-cage rotors, which were used widely in the past (see Fig.14). 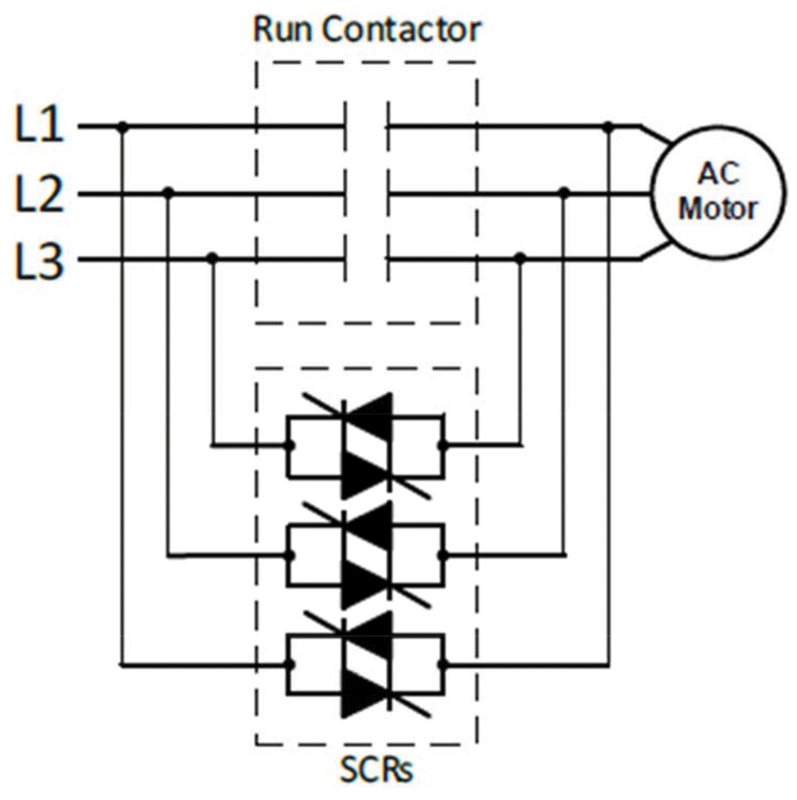 This solution produces high torque with low current when starting, but has no effect in normal running. In most cases the output power of the machine is reduced and the price is slightly higher. Two separate end rings are required, making the mechanical structure relatively complex. TMEIC: “Selecting the right strategy for starting large motors”, TMEIV application edge, Vol 1 issue 3. L Teschler: “Soft starters”, Machine design, July 2014. 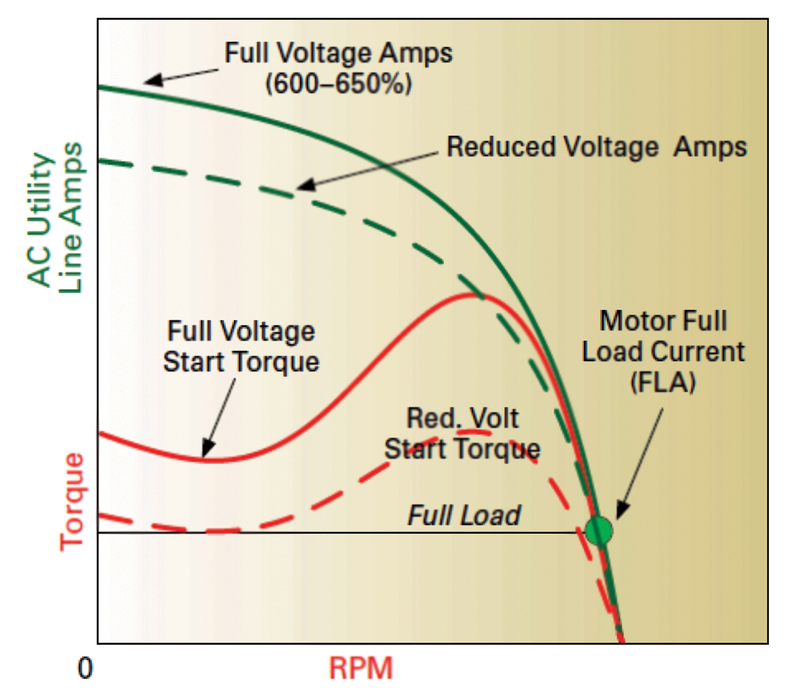 J Nanny: “Select the right strategy for starting large motors”, Pumps and systems, November 2014. WEG: “Choosing a variable frequency drive or soft starter based on your application need”, WEG white paper 2106.